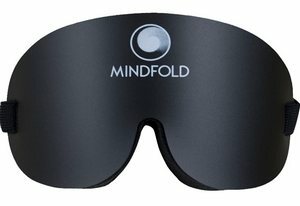 Mindfold™ Relaxation Mask is a super comfortable meditation mask designed by Alex Grey to take darkness to a whole new level! It is made from flexible black plastic face-plate backed with a high-density soft foam padding. The foam padding has cut outs specifically designed to allow you to experience total darkness even with your eyes open, blocking all light so as to stimulate the visual cortex nervous system and pineal gland. Adjustable Velcro head strap allows you to fit the Mindfold™ mask to your face. Designed to provide comfort throughout your meditate, sleep, relax or travel, the Mindfold™ will aid you to gently fall into Alpha Wave patterns, allowing your conscious and unconscious mind to turn inwards. The Mindfold™ is the perfect aid for daytime mediation.